camp" and the "war camp." standing, wife Lois, daughter Cheryl, and son Jack. gymnasium at the SorefJCC on the Perlman Campus. and Dr. Abraham Gittelson, CAJE director, look on. Hatikvah and the national anthem. Mission this fall," Says Daren. Women's Division campaign Outgoing president Brian J.
special award from Sherr. Janet and daughter Alexa. Addison of Temple Beth Israel. Sherr. Alan Levy, Sheldon Polish, Steven Lewin, and Daniel ^^^^^Sp^^^f'^ prww^ to\ommitTclJrlnZlulw%Brod2ki. utter enchantment in the delightful world of tradition. may also be pronounced, "Dun't esk!" "Shalom, Teddy. How's your wife?" "They, thank God, are fine." "I can't complain. Excuse me, Henry, I have to go "
how I am, how's my Shirley, my job?" From today on Henry! How are things with you?" ing Ike" Yunich, who went into the ring for the first time. up, his manager yelled, "No, no! Stay down until nine!" Ike nodded, dazed. "What time is it now?" need! Why, I shouldn't even be lying next to you!" worries, problems or afflications. The Hebrew is "tsarah,"
which is defined as trouble. very strict. We'll have to use a code." P.S. There's only one thing I couldn't find here: red ink." much fun. Maybe some more a little later? Don't ask! Leadership group of the Atlanta GA Federation. POSTMASTER: Send addrats change* to Th Jewish Floridian. Jewish Federation o' Greater Fort Lauderdale. P.O. Box 26810, Tamarac, FL 333204810.
tion president and Harold L.
since coming to South Florida. tion/UJA in the coming year. and more than 560,000 in the State of Florida. million Jews, 2.5 percent of America's 232,000,000 people. ly 13 million are Jews, less than 0.3 percent. there is not an inkling of Jewish propriety. tries in which they reside. uncles and who would have borne our cousins. destruction of those horrific years. most important, Jewish community in the world. million today, one thing still holds true. voluntary non-sectarian social services today. danger to the people of Israel. but I need something more,"
Overflew crowd for Federation/UJA at Coral Springs Breakfast. mand, Dr. Jay Oremland, Dr.
man, Dr. Ricky Schnieder, Dr.
Green, Dr. Martin Stone, Dr.
on the colony's public coffers. was unknown to this despot. ment to the delight of all! and ordered not to publish anything on that subject. Samuel of the Weizmann Institute of Science. v, cup bullet or margarine. sour cream, mustard and eggs. Gradually beat in cornslarch. Must I be stalked like this? or Call att.r :M P.M.
nicotine. SOFT PACK 100's FILTER. MENTHOL: 3 mg. "tar." 0.3 mg.
caring, Decause we neip to exceptional leauer m oui ioo anve to acnieve nut and is instrumental in me -jr ,----.,"7 ""
Israel and 34 other lands. ing, they have two sons. Around him, the office buzzes. ly the eyes betray his 76 years. are four old-age homes. Dr.
brought to us in terrible shape. ways as it was of the West's. other in the Communist world. also holds a degree in law. chemicals) has paid off poorly. light bulb is allowed per room. Restaurants close at 9 p.m.
mention cheap or free meals. speak to a full congregation. headed for his waiting car. lived, will have fewer than 40.
doesn't seem to be the point. Floridian, P.O. Box 012973, Miami, FL 33101.
other extras. 4 it 7 nights packages available. See your travel agent. Chair and Miami Area Chair. ( rafts 1 l.i-.-.,s And Mil Ii Mori'! millions of dollars in illegally laundered narcotics profits. tions including conspiracy to distribute cocaine. against Jews and other groups in southeastern Europe,"
sion of the Anti-Defamation League of B'nai B'rith. civil rights laws adopted in 1886.
of the American Israel Public Affairs Committee, the U.S.
support for Israel is deep and lasting. i are \nd there s more. what they want out of life. coupon below, or call today. (305) 975-8900. Over 300 Celebrate Yom Yerushalayim NW8Wlre/U.S.A. man, executive director of the Jewish Federation. 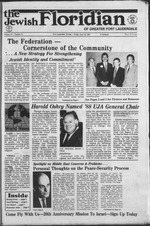 tion of the Jewish Federation. contacted at 30 Soundview Lane, Sands Point, N.Y. 11050. ^ffi Where keeping Kosher is a delicious tradition. airports much closer to us? distracted from the real issue. an army, navy and air force. is no one to talk peace to. has been filed by Rep. Joe Titone (D., Coral Springs). mon by the members of the association. The Land of the Cattails. ireet, New York, NY 10022. |>f this latest novel's title. ponsoring it in the House. oldman, to wear a yarmulke. because of them at the next. doomed route of his mother. iterary comparison is also apt. and electronic media during the past month. degenerates, or perhaps young uneducated vandals? Waldheim, Linnas, Demjanjuk copy set the acts in motion. across to this band of miscreats. growing community standing tall and proud. Atlantic for Jay's soda bottle. where it landed," says Tunick. 60 miles west of Scotland! tight and we collect them." will be offered to all campers. families in the JCC pool. Prices effective Thurs.. June 18 thru Wed..
tive life in Coral Springs. rounded by friends and family. never have gotten the chance. your whole family will enjoy a tenific spread. 1985 and 51,000 in 1979.
rently would seek to emigrate. could be expected to emigrate. delivered with a cynical twist. be backed up with action. TNI MIU TWO) FM FMMUO! Our new 7-month CD earns a very competitive 6.5% annual interest rate. tax rates will be lower for many people. That won't make the IRS happy-but it will put a smile on your face! $2S00 minimum investment Interest rate is subject to change Substantial penalty for early withdrawal. a nominal cost. Nob Hill Rec. 7200 NW 17 St., Plantation. If Not Now, When. PrimoLevi. some of the major Jewish Federations' $ 's progress to date. a Bar Mitzvah on that day. Mitzvah celebrant at Kol Ami. Michael Segelnick, son of Dr.
at Ramat Zion in Jerusalem. Relations Strained As Justice Dep't. no treaty between the U.S.
return him to the U.S.
president is Carey M. Fischer. Fort Lauderdale, teachers of the Religious School were honored. day 8 p.m., Saturday 9 am., 5 p.m. Rabbi Avaroa Drazin. Caator Irvia Bell. TAMARAC JEWISH CENTER (721-7660), 9101 NW 57th St, Tamarac, 33321.
day 8:46 a.m. Rabbi Kurt F. Stone. daily 8 a.m.; Sabbath 8 p.m.. Sabbath morning 8:45 a.m. Rabbi Avraham Kapnek. Saturday 8:45 am., 7:45 p.m. Rabbi Howard A. Addiaon, Caator Maurice A. Neu. Joseph Langner, Cantor Shabtal Ackenaan. TEMPLE B'NAI MOSHE (942-5380). 1434 SE 3rd St, Pompano Beach, 33060. Services: Friday 8 p.m. Cantor Jehudah Heilbraaa. TEMPLE SHA'ARAY TZEDEK 741-0295). 4099 Pine Island Rd.. Sunrise. 33321. 8:46 a.m. Rabbi Israel Halpera. Friday at 6 p.m., Saturday at 8 a.m. Charles B. Frier, President. 8 a.m., 7 p.m., Saturday 8:45 am., 7 p.m.
bi Caaim Schneider. Congregation president: Herman Fleischer. TEMPLE BET TIKVAH (471-8088), 8890 W. Oakland Park Blvd.. Sunrise, 33321. Services: Friday 8 p.m. Caator Richard Brown. vices: Friday 8 p.m.; Saturday 10 am. Rabbi Mark W. Gross. Menorah Chapels, 2305 W. Hillsboro Blvd., Deerfield Beach, 33441, Friday 8 p.m. Rabbi Nathan H. Fish. Caator Morris Levinson. TEMPLE EMANU-EL (781-2310). 3245 W. Oakland Park Blvd.. Lauderdale Lakes. Bat Mitxvah. Rabbi Jeffrey Ballon. Cantor Rite Shot*. Creak Parkway. Rabbi Brace S. Warshal. Cantor Barbara Roberts. evenings at 8 p.m. Rabbi Lewis Littmaa. lawyers) to defend its errors. turning into a "weak toe,"
did not give any "green light"
benefits. Position available as of July/August 1987.
by the law's strict standards. 7- It signifies life in Hebrew.